Did you know that this month JustRite Stampers is celebrating their 2-year Anniversary with their first Blog Team Members? They have quite the celebration planned in honor of that Anniversary! 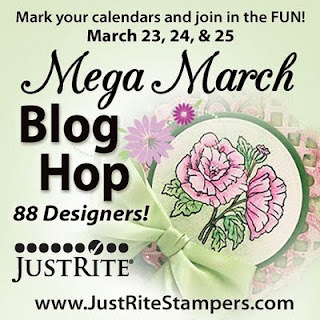 JustRite is hosting a huge event, a Blog Hop spanning 3 days and featuring artwork from 86 designers! Now that is just the beginning of the celebration -- it wouldn't be a party without prizes! And since it is their biggest hop ever, they are giving away shopping sprees which will total $1800!! I am participating on Day 1 and have a project to share with you tomorrow. I hope you will stop by and I will be holding thumbs that one of you win BIG on my blog. Never thought to use the punches on a candle. Very outside the box. Love it! It is very interesting for me to read that post. Thank you for it. I like such themes and anything connected to this matter. I would like to read a bit more on that blog soon. It is certainly interesting for me to read this post. Thanx for it. I like such topics and anything connected to this matter. I definitely want to read a bit more on that blog soon. Cool story you got here. It would be great to read more about this matter. The only thing I would like to see on that blog is a few pics of any gadgets. Rather cool site you've got here. Thanks the author for it. I like such topics and anything connected to them. I definitely want to read a bit more soon.